WELLINGTON/SYDNEY (Reuters) - As politicians hit the hustings across the Solomon Islands two weeks out from a general election in the South Pacific archipelago, the loyalty of one of Taiwan's few remaining allies is in the balance. Some Solomons' candidates are promising to review lucrative, but loosening, ties with Taipei that if broken, could trigger a reshaping of diplomatic relations in a region home to a third of Taiwan's shrinking list of allies. "Sooner or later, when we see our country hasn't been able to grow out of this relationship, we are at liberty to review our relations and to explore other avenues," said former Prime Minister Gordon Darcy Lilo, who is contesting the election. Lilo's views, echoed in the rival ruling Democratic Alliance Party policy manifesto, and by other candidates, have caught Taipei's attention. President Tsai Ing-wen is also touring the South Pacific this week, visiting other allies Palau, Nauru and the Marshall Islands to "deepen ties and friendly relations". Already five countries have switched recognition to China since Tsai took office in 2016, leaving just 17 mostly small, undeveloped countries that formally recognize Taiwan. The elections also come at a time when traditional regional powers from the West and Japan have been boosting their presence in the Pacific due to unease at China's growing influence there. Last week, the new U.S. ambassador to Australia said China was using "pay-day loan diplomacy" to exert influence in the Pacific. "The West is watching the outcome of the election in the Solomon Islands very closely. There is no doubt that there are some Solomon Islands lawmakers who would like to align with China," said a senior U.S. diplomatic source. "There is a legitimate worry that it will have a domino effect." Acknowledging that China takes the position that there is "one China" and Taiwan is part of it is the "common consensus of international society", said Chinese Foreign Ministry spokesman Geng Shuang. "The Chinese government, under the one China policy and the principles of peaceful coexistence, develops friendly cooperation with countries across the world,” he said, without elaborating. The Solomons have recognized Taiwan since 1983. The Solomons' situation is further complicated by an unpredictable coalition building process after the vote, expected to last weeks before a government is formed. "I think China is trying everything they can do to replace us in our diplomatic allies," Taiwan's deputy chief of mission to the Solomons, Oliver Liao, told Reuters in a phone interview. He said Taipei was cautiously optimistic of retaining Honiara's friendship because it has a long history of rural-development donations. "Many friends here continue to share with us how much they appreciate Taiwan's support and how they appreciate the flexibility this budgetary support allows – politicians and also the citizens." Taiwan's support of around $9 million a year is paid directly into a government account which lawmakers tap for projects in their far-flung provinces, with little oversight. "In the rural areas there is no tangible development," said Andrew Fanasia, politics reporter at the Solomon Star newspaper. "Mostly these people blame their leaders and this fund." Anti-graft agency Transparency Solomon Islands says "vote buying" with cash linked to development funds is by far the most common complaint it fields, according to data it collected in 2017 and 2018. Lawmakers say there are successes, and the government's rural development website lists health and sanitation projects, community buildings, and text-message testimonies from citizens about improvements to their lives. But even Taiwan's Liao - and former prime minister Lilo - say economic progress has not been fast enough. And in the capital, patience with the incumbents charged with disbursing Taiwan's largesse is in short supply. 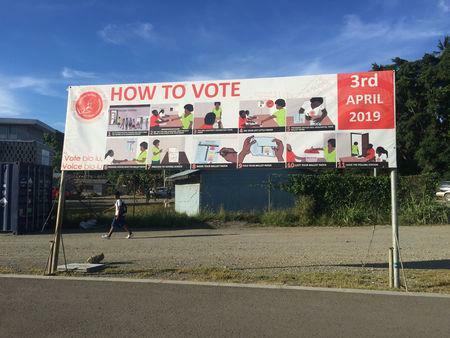 "Most students would really like to see a change in the leadership and style," said law student Ishmael Aitorea, 25, on the phone from the student association office of the University of the South Pacific in Honiara. "The perception is that if the old parliament members go back, nothing will change."